New ball points game record? 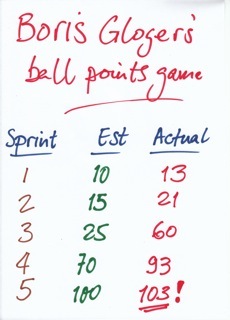 Last night Mike and I ran Boris Gloger's "ball points" game for the monthly Cape Town SPIN meeting. We had a group of twenty-something IT professionals who got off to a flying start by immediately organising themselves into the classic concentric circle formation. Yet their score in sprints 1 and 2 were pedestrian. In the reflection after sprint 2 they shed one member to make their number even (illegal?). In sprint 3 the team 'gelled' and the score raced up to 60! They asked what the record is. We said we thought it was eighty-something. Then they made an adjustment to their process that Mike and I had not seen in perhaps 20 times we've done this exercise: they threw the balls two at a time. Not exactly throwing, mind you; more like dropping from one person's hands into the next. To my surprise it worked brilliantly with very few 'bugs' (dropped balls). They managed 93 and 103 points in their final sprints and were justifiably pleased with themselves.